We live in a globalized world where virtually all countries interact and engage in trade. Most of them have various trade connections with a multitude of different countries. 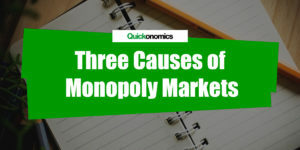 As a consequence, there is a significant amount of competition. This raises the question of how smaller countries with relatively weak economies can still participate and benefit from global trade (see also types of trade barriers). To explain this we will look at the principle of comparative advantage, one of the most basic microeconomic concepts. Even though it is a rather simple concept, it will allow us to analyze some of the most fundamental processes behind production decisions and trade. So let’s get started. The principle of absolute advantage builds a foundation for understanding comparative advantage. It is commonly used to compare the economic outputs of different countries (or individuals). By looking at the inputs required for producing a unit of output, it is possible to determine which country has the highest productivity. In other words, the country that requires the least inputs to produce one unit of output is most productive and therefore has an absolute advantage. To give an example, let’s look at two countries (A and B) that both produce cars and bikes. The two countries use the exact same materials, only the makespans for the products are different. In country A it takes 10 hours to assemble a car and 5 hours to build a bike. In country B, on the other hand, it only takes 8 hours to finish a car and 2 hours to assemble a bike. Hence, country B has an absolute advantage in producing both cars and bikes (see table 1). As we can see, this illustration does not provide any information on how these countries can profit from trading with each other. It looks like country B has little incentive to trade since it is more efficient at producing both cars and bikes. So to see how trade can actually benefit both of them, we shall introduce the concept of comparative advantage. An important aspect that is omitted if we only look at absolute advantages is the presence of opportunity costs. All countries only have a certain amount of resources available, so they always face trade-offs between the different goods. As we know, these trade-offs are measured in opportunity costs. Thus, the country that faces lower opportunity costs for producing one unit of output is said to have a comparative advantage. For example, if country A produces a car it has to spend 10 hours that could have been used to work on the bikes. In fact, it could have instead assembled 2 bikes (since it only takes 5 hours to build a bike). Obviously the same goes for producing a bike. The time spent finishing one bike could have alternatively been used to build half a car. If we apply this to country B, we can see that the time spent producing one car could have been used to finish 4 bikes. 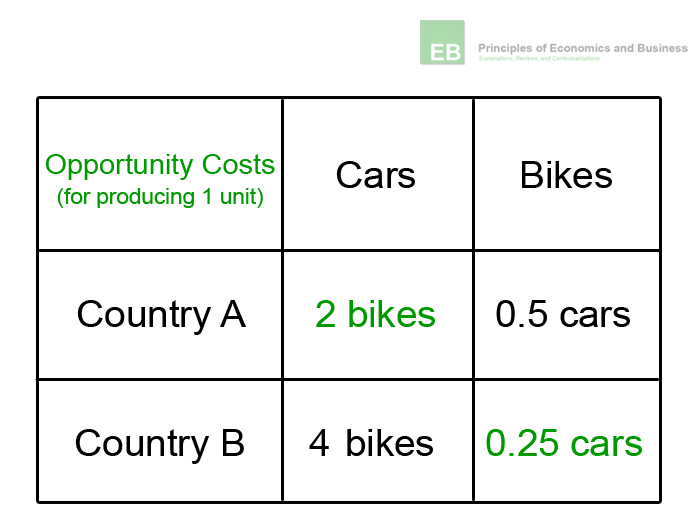 Meanwhile, one bike has an opportunity cost of 0.25 cars. Hence, country A has a comparative advantage in producing cars, while country B has a comparative advantage in producing bikes (see table 2). The important thing to note here is that it is impossible for a country to have a comparative advantage in all goods. Because the opportunity costs of one good are the inverse of the costs of the other products, there is always at least one good with relatively high and one with relatively low opportunity costs. 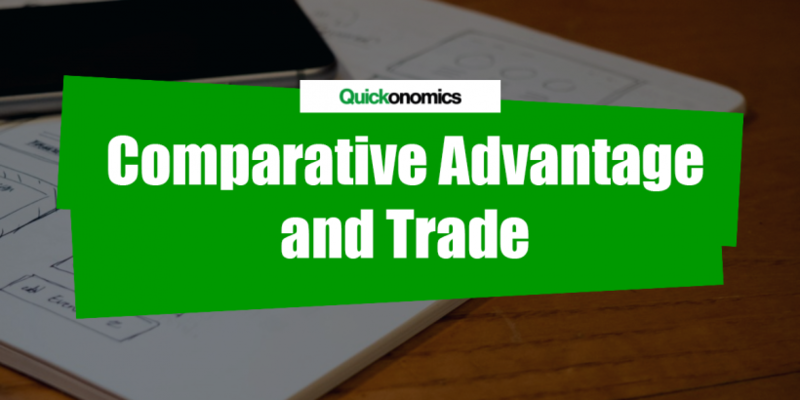 The concept of comparative advantage suggests that as long as two countries (or individuals) have different opportunity costs for producing similar goods, they can profit from specialization and trade. If both of them focus on producing the goods with lower opportunity costs, their combined output will increase and all of them will be better off. 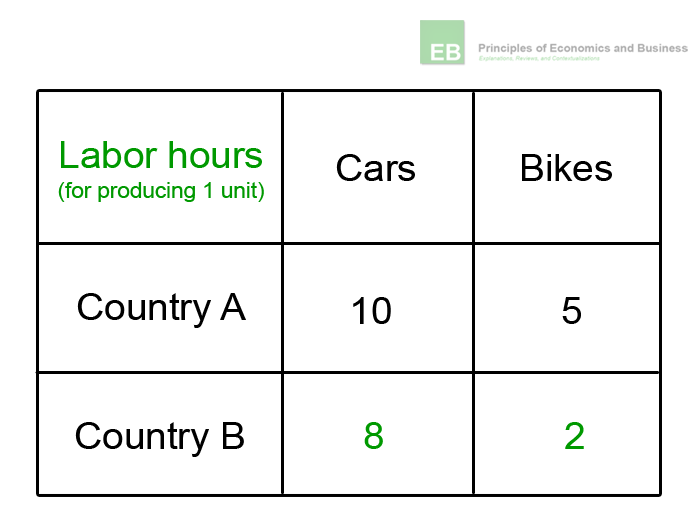 Revisiting our example, assume that both countries have 2’000 labor hours available. If they both decided to allocate half of those resources to each product, country A could produce 100 cars and 200 bikes while country B could produce 125 cars and 500 bikes. This would result in a total output of 925 units (see table 3). Now, if country A specializes in the production of cars and country B specializes in the production of bikes (i.e. the respective goods with lower opportunity costs), their outputs will look considerably different. In that case, country A will produce 200 cars and no bikes while country B will still manufacture 25 cars and use the rest of its time to produce 900 bikes. This results in an overall output of 1125 units which equals an increase of 200 units due to specialization (see table 4). Note that country B does not fully specialize in order to be able to maintain its current supply of cars, because country A cannot produce enough for both of them even by specializing. However, in most cases (i.e. if both countries can produce enough goods to maintain at least the current level of consumption) it most efficient for both countries to fully specialize in only one good. 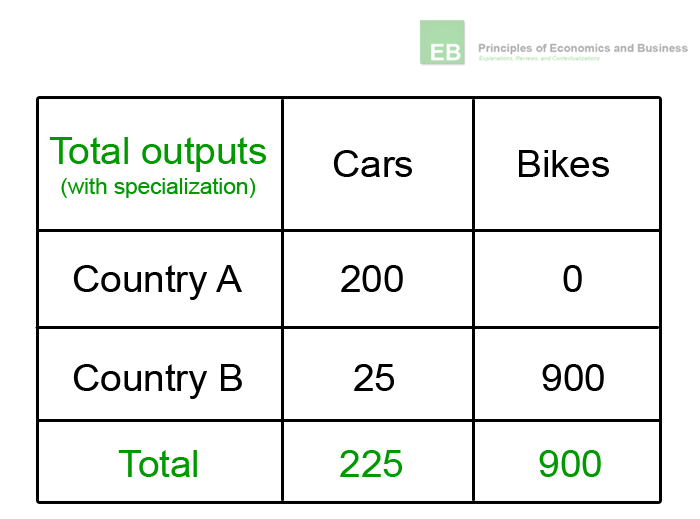 As we have seen in most situations the overall level of output can be increased if countries use specialized production. The additional output can then be traded in a way that benefits all parties involved. However, there is no optimal solution for such trade negotiations, thus the outcome mostly depends on the power structures between the two countries. Furthermore, it should be noted that even though both societies as a whole will be better off due to trade, this may not necessarily hold true for all individuals within the countries. 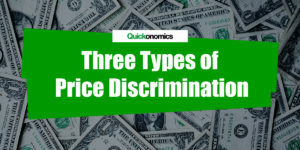 For instance, if country A decided to put all its efforts into producing cars, companies, and individuals who produce bikes will be left out and thus be worse off than before. Finally, we must be aware that countries produce a wide variety of different goods in reality and there are far more actors involved. As a result, the decision making and coordination processes become much more complex. In that sense, the principle of comparative advantage is merely intended to provide a basic understanding of the underlying processes of trade. Trade is a global phenomenon that virtually all countries participate in. Even countries that have absolute advantages (i.e. more efficient production processes) in all relevant goods can still profit from trade, as long as they have different opportunity costs. In those cases, there is always at least one good in which another country has a comparative advantage (i.e. lower opportunity costs). 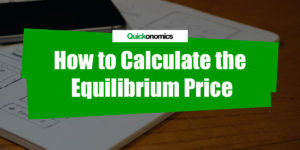 This is due to the fact that the opportunity costs of one good are the inverse of those of the alternative goods, so it is impossible to have the lowest opportunity costs for all relevant goods. By specializing in goods with lower opportunity costs the countries involved can increase the overall level of production and then split the additional output according to individually conducted trade negotiations.